Left image a tear forms on the tip of The Blessed Mothers nose. Right image Priest Juan Angel Lopez wipes Our Lady's tears. August 30, 2016 - Reported in [Spirit Daily.com] from [here]. 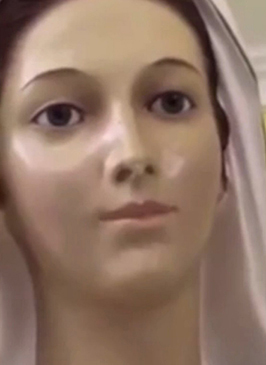 Statue of Virgin Mary seen crying in Honduran university church leaving worshippers baffled.Priest Juan Angel Lopez has dismissed rumours the weeping effigy in Danli, Honduras could be a fake - but he has been left mystified by what is causing it. Worshippers have been left baffled after noticing a statue of the Virgin Mary crying at a university church in Honduras. Priest Juan Angel Lopez said today that he was certain the weeping statue has not been faked - but he too had no idea what was causing the unusual occurrence. People first noticed the strange goings on with the effigy at the Campus Santiago Apostle, in the Catholic University of Honduras at the weekend. Spooky footage shows tears welling-up in the statue's eyes before they eventually fall down its cheek. Priest Lopez is then seen talking to the camera before wiping away the tears with a tissue. Priest Lopez, who is the Pastor of the Iglesia Santo Domingo Savio church in nearby Tegucigalpa said he had seen the statue at the St James campus in the El Paraiso area. He told Honduras website La Prensa : "I'm not saying it's true, I'm saying it's possible. "In this case, I suspect that there is no falsehood because I know people who run the Campus Santiago Apostle. "I know the seriousness of people who have recorded the video and do not think they would fake it."